Why settle on managing a PR job, two children and food passion? The School Parent Teacher Association needed a new Chair. And Yours Truly stepped in valiantly. How difficult could it be, I thought? All this needs is a bit of Corporate know how. Strong leadership at the helm, followed by excellent delegation and efficient delivery. If there was ever a community-led use of the years of Corporate slavery, then this was it. It wasn’t. Cue: a shock initiation to the Voluntary Sector. The Cinema Social, Coffee Mornings and Playground sales paled in signifance compared to the Winter Fair. An after school extravaganza for the children and their families run with virtually no budget, and one child hanging off each trouser leg in the playground. The only answer was to dazzle the children with a panto Frozen skit by two actor mums, and a guest appearance by Olaf: a hapless male teacher no less. A quick warm cup of mulled wine in the biting cold, and I was practically ready for Christmas. And Christmas it is soon. If you’re looking for easy party food nibbles that don’t pile on the pressure, then these divine Mahi Kebabs, quick fish kebabs, could be just the answer. I found this recipe in Reza Mahammad’s Rice, Spice and All things Nice and made a few small tweaks to it, like using dill as it goes so well with salmon. And minced more of the fish than directed to help the kebabs bind. Of course, I also grilled instead of shallow frying. My solution to cooking any food in batches is to shove it under a hot grill and flip half way through cooking. That’s serious time saved watching hot oil in a frying pan. Must make a note to not go filling the free time with another project! Bring the grill to heat on a high setting. Dice the cod, and half the salmon, into small chunks and blitz in a food processor until roughly minced. This doesn’t have to be a smooth mix, just a sticky dough that’s easy to shape. Next, combine this dough with rest of the fish, grated zest of the lime and all its juice, herbs, spice powders, salt and finely grated ginger and garlic. Mix the whole lot well with your hands, combining all the ingredients. Then shape the dough into fishcakes and grill for 12 minutes on each side until golden. Serve the Fish Kebabs hot, with lemony cucumber and dill as a starter, or coconut chutney as party nibbles. Ah, yes, coordinating volunteers is so much different than a paid work force! The rewards, though, far outweigh the hair pulled out and the remaining hairs turning grey. Yes? These kebabs look delicous and I look forward to making them for my family. Thank you! Your fish kebabs look quite tempting and I would love to try them right now if only I could get a good peace of salmon. 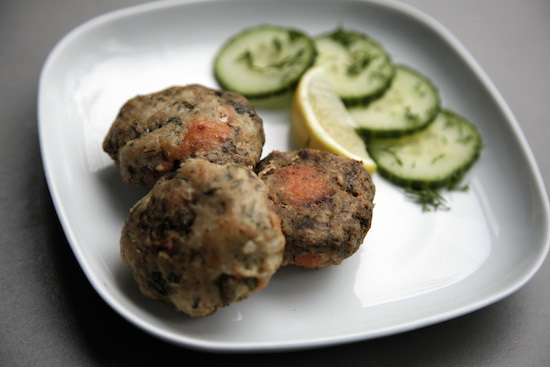 The spices with the coriander and dill combined is just perfect. Hi!… Came across ur blog! !…Great effort…nice pis..will follow ur blog. Already went through some recipes. These kebabs look stunning. I blog from Germany.